The customer, a leading Telecommunication major based out of France requires AABSyS create GIS & Digital Maps. The customer requires maps of 5X5 meter resolution for cluster and 20 m resolution for terrain data. AABSyS project coordinator worked alongside the client’s project manager for delineating precise area of interest in latitude -longitude geographical coordinates in order to identify and procure necessary toposheets for the AOI at each of the respective locations. The resources digitized sufficient contours in an optimal manner to ensure generation of a good quality DTM. All the spot elevations (Triangulation points, Bench Marks, Spot heights) representing the exact elevation of the terrain at the given location will also be captured. AABSyS in-house team will also create LULC data from satellite imagery with reference and validation from reliable sources. The digitized LULC map and vector data-sets were delivered to the pre-decided locations. A team of 2-3 resources were deployed per location for coordination of collection of scanned toposheets and georeferencing of the SOI toposheets. The data was integrated and final DTM, clutter and vector data in Planet and MapInfo format as per the costumer’s specifications. Two senior managers from AABSyS traveled to the customer site for training on source data structure, specification, methodology and pilot data capturing. The team at AABSyS used high end, up-to dated software such as ERDAS Imagine, ArcMap, etc to complete the given task. Few indigenous auto lisp routines were developed in order to expedite the drafting process and assure quality deliverable. AABSyS was in continuous correspondence with the clients in order to solve any queries/ doubts. The task was completed at locations specified by the customer. 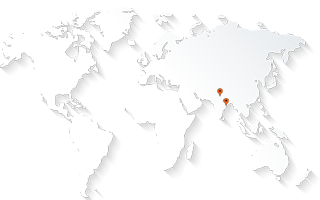 AABSyS has been providing GIS services for more than 17 years. The client, a leading telecommunications company based in Europe appreciated the flawless LULC maps, clutter and vector data provided by AABSyS. They helped the company in making informed decisions. The deliverables were provided in a time bound, cost effective manner. An extensive quality assurance procedure ensured delivery of perfect LULC maps and Clutter and Vector data.